AlleyNYC has been the home to hundreds of startups. Each and every startup could use a bit of help, either with funding or mentorship. On the flip side of the coin, big businesses need to innovate and learn from startups how to develop in an agile, lean environment. Startups sometimes fail because they do not have the right insight into big business issues, and big businesses are getting crushed by companies that are being built out of coffee shops and coworking spaces. To figure out a solution we decided to put them all in a room together. AlleyNYC worked with one of the most innovative ad agencies on the planet, Rapp, to host an event that got everyone in the room thinking BIG. We selected six AlleyNYC companies to pitch top level executives at Rapp in an event we called “Collide.” Here is a look at the companies. 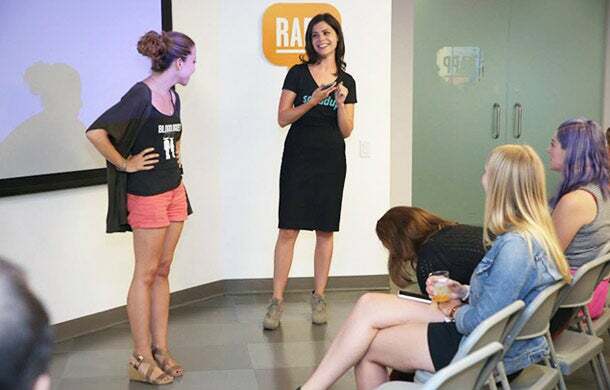 Blogologues co-founders Alli Goldberg and Jen Jamula MC the AlleyNYC/Rapp Collide event. PRO TIP: We used Blogologues sketch comedy group to MC the event. They offer classes on public speaking for startups and large organizations and they are gut-wrenching funny. Culture IQ. A SaaS product for strengthening company culture, Culture IQ helps companies understand their culture and implement initiatives to improve it. Quick MVP. Rapidly test your ideas without wasting time or money using beautiful landing page templates and Google AdWords. Brainscape. Find, create, and share smart flashcards based on brain science. Brainscape intelligently processes each flash card and modifies the repetition pattern based on how well integrated the answer is in your long-term memory. Teachley. Teachley creates apps based on cognitive science research, and captures meaningful data for teachers about what to teach next. Unlockable. Unlockable lets people pay for content by playing ad-based games. Anywhere a "Buy" button can go, an "Unlock” button can go next to it. All of their games use only existing video ads with no additional production, making it easy for brands to get started. SquadUp. SquadUP lets users create a customized event webpage that seamlessly integrates with all social media channels. From the event page, hosts can send invitations, track RSVPs, sell tickets, collect donations, and communicate with guests in real-time. Pijon. Pijon is a subscription college care-package service, helping college students get what they love and need every month from the people that love them most. This event was put together in part with the help of Rapp’s Craig Elimeliah and AlleyNYC’s Nathan Snyder, who did an amazing job. HUGE shout out to both teams that assisted in this awesome event. Collide was the first step into getting the conversation going. We are currently building solutions out of the conversations that got started from this event. PRO TIP: Other organizations are plotting on tackling the startup-big business challenge, such as Empirical.ly. My great friend, Mike Gold, who is CEO of Empirical.ly, is leading this charge by doing conferences and innovative workshops. Follow his blog here. With all these smart people involved, I am sure a solution is right around the corner that will help startups and big business get together and change the world. Look for more news about this in the near future and the next Collide event. Until then, hustle ON.